1 What Are Grass Shears? 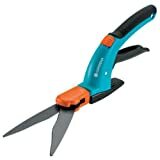 1.1 Manual or Electric Grass Shears? Have you ever been using your string trimmer to trim your edging and nicked your prize peach tree? Found yourself in a position where you just didn’t have the right mower or trimmer to get into a tight spot? Then you need the best grass shears you can find, and you need them quickly. Thankfully, I can help. Today we’ll discuss what you need to know to pick out the right pair of grass shears for your job. 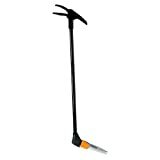 Whether edging or topping your lawn, or just cleaning up weeds around your borders, you need a quality tool. By the time you finish this, you’ll know exactly what you need to clean up that ragged strip between your garden stepping stones! Grass shears, in their most rudimentary form, are essentially scissors for grass or light weed trimming work. There’s two basic categories of manual grass shears: edging shears and topping shears. There’s also swivel-blade grass shears which can be used both as edgers or toppers. They’re quite useful if you have to get into awkward areas that your normal lawn edger won’t handle. Topping shears are meant to evenly trim down grass to a particular height. If you’ve got some awkward places where the lawn mower just won’t fit, and it’s too difficult to get a string trimmer in there, topping shears are going to be your best bet. Swivel-blade shears feature a mechanism that allows them to be swiveled so that the blade will either be vertical (like a normal pair of scissors) or flat (to top off grass evenly). These can either have a few positions where they will lock in place, or can swivel 180 degrees with a lock that can stop anywhere. If you only want one pair of grass shears, that’s your best bet. Manual or Electric Grass Shears? The biggest issue that most people have with a pair of manual grass shears is that you’re going to be opening and closing the handle. At this point, most manufacturers have made this process simpler by adding a spring that opens the blades, but you’ll still have to squeeze the handle closed. But what if you’re dealing with grass with a lot of woody and dense material in it, or very thick grass? These can often get stuck in manual grass clippers, or they’ll take a lot of hand strength to cut through. 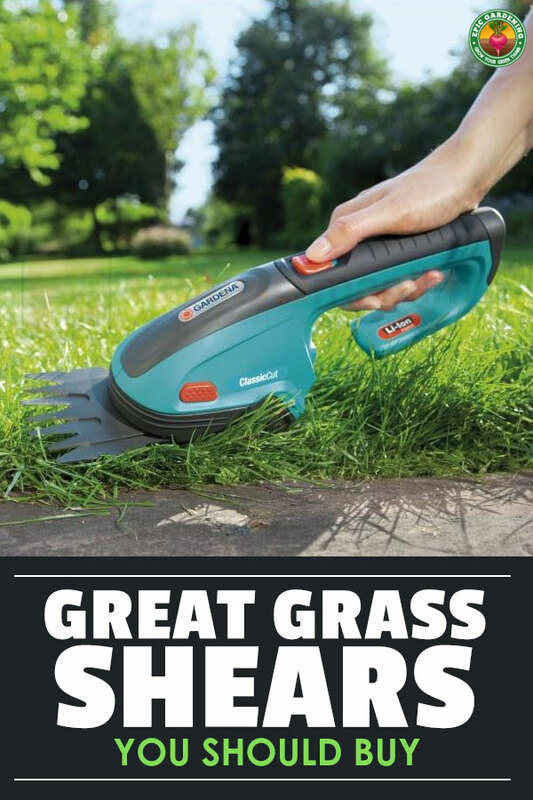 Enter the cordless grass shears. These battery powered grass shears act like a miniature lawn mower, using sharp sawteeth that slide across each other to neatly shear down your grass. The only problem with these is that they can really only be used as toppers. Edging with these is tricky at best. However, if you’ve got thick seed-bearing grass stems or weeds, the cordless grass shears will save you a whole lot of heartache. It’s definitely a useful tool to have on hand. For manual grass shears, there’s a few things which need to be looked at before you make a purchase. First, you’ll want to be sure that the blades are sturdy. Steel is preferable for any tougher materials. Blades which are coated with teflon or other non-stick coatings make cleanup easier and ensure your blades won’t rust. You don’t have to have coated blades, but it can really make the task easier! Ensure that the handle has a spring grip, and that it’s comfortable to hold. While traditional scissor grips are available, many people don’t find those as comfortable when doing a lot of shearing work. Soft coatings on the grip will also help protect against blisters. If you have any difficulty bending down, consider a pair of long-handled grass shears. These allow you to trim without having to bend over, which can spare your back! 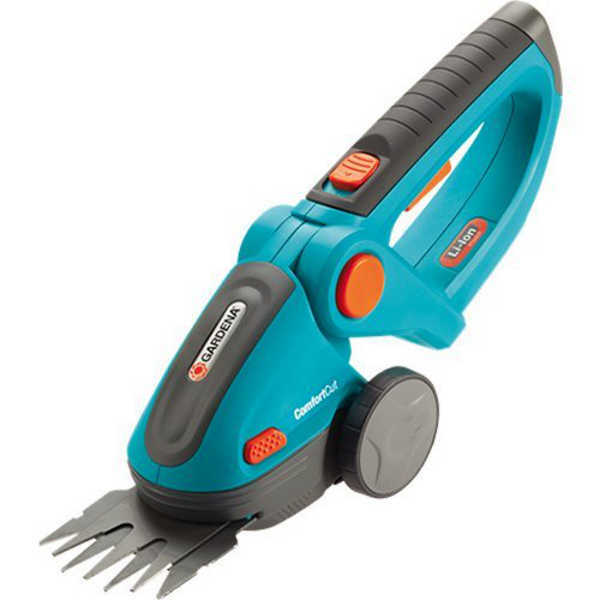 Cordless grass shears should have a long-lasting battery and should be comfortable in the hand. Be sure that if you opt for a version which doubles as a shrub trimmer that the blades secure well in the device. DURABLE BLADES: Fully heat-treaed for strength. FORGED STEEL ALLOY BLADES: Blades are resharpenable. Extremely tough, the heat-treated steel blades of the Corona grass shears will easily slice through tough sod and light grasses alike. While this hand held grass trimmer is not the most glamorous to behold, they’re a tried and true design that’s been in use for years. A vinyl, non-slip grip allows for good control, while a strong spring helps open the blades between each squeeze. The blades can easily be sharpened between uses to ensure you’ll always have a clean cut. There are replacement parts available in case you need them, and these shears come with a limited lifetime warranty. All-metal construction ensures that these Berger grass shears will stand the test of time. The blades are coated with an anti-adhesion coating which keeps plant debris and trimmings from sticking. Powerful spring action helps to open the blades between cuts. No matter how hard you need to work, these grass shears are up to the task. They can be resharpened to keep the blades honed and ready for your next task, and they will last and last! Sometimes, traditional fixed-blade construction makes for the best grass shears, and this is the top of its category. 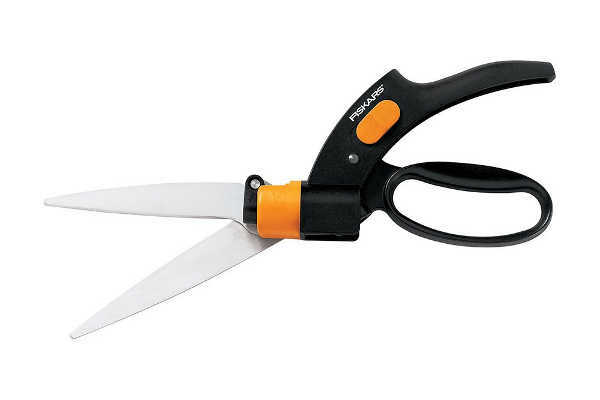 Fiskars is top of the line for scissor construction, and that shows through in this pair of Fiskars grass shears. Stainless steel blades are mounted into a Nyglass body that can withstand a beating. Easily adjustable to suit your preferred angle, these grass trimmers can easily handle the task. Whether you’re trimming around a tree base or along the edge of your raised bed, these are the best grass shears for your job. The price is extremely reasonable, and your new grass clippers will come with a limited lifetime warranty. We all get older. After a while, kneeling or stooping over to deal with tasks just isn’t as easy as it was before. 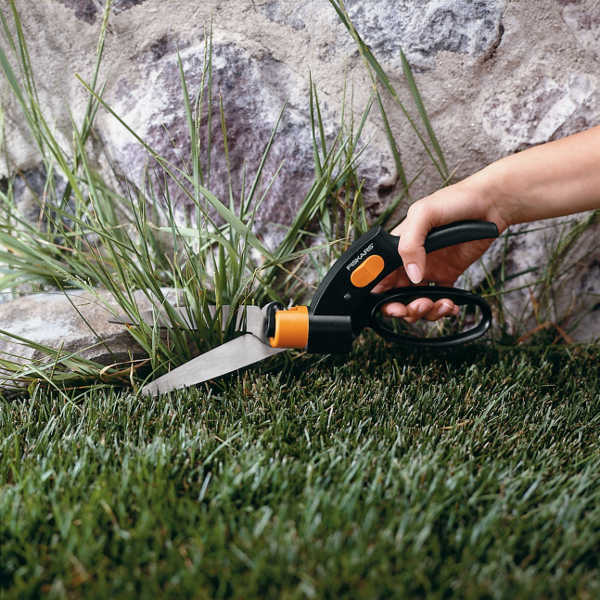 But with these Fiskars grass shears, you won’t need to crouch down to trim along your raised bed again. Steel blades swivel 360 degrees so you can set them exactly where you want them to cut. The long handle on these grass shears allows for comfort while you’re trimming up that long edging strip on your landscape feature. Spring-loaded grips easily pop right back open every time you squeeze, giving you an easy cutting experience. Simply stated, these are the best grass shears you could hope for if you’ve got a bad back or a trick knee. They’re well worth the money spent! There are many variations on electric grass shears available on the market. My recommendation for the best cordless grass shears has to be the Gardena 8893-U Comfort Cut, and here’s why. First, the grip is extremely easy to hold onto. Turn on the power, and a light squeeze will activate the trigger. You’ll be trimming away in no time. Sawblade edges will chew right through whatever you need to trim. Even better, there’s an optional extension handle available which ensures you don’t have to bend down to do the job. Anyone who’s suffering from back problems will love the ease of use. The blades are replaceable, and the internal lithium-ion battery will keep this electric grass trimmer cutting for 90 minutes at a time. 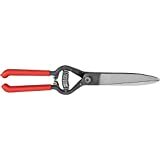 These qualities make these shears my top choice for the best grass shears in the electric/cordless category. You can’t go wrong with these. Carbon steel blades provide an excellent cutting edge for these grass shears. They’re used by landscapers to do detail work and to trim hard-to-reach areas for a reason! The shears have swivel-blade construction to enable you to set your blade angle, and a nice action. My only real complaint about these is the vinyl-dipped handle. Vinyl rapidly becomes slick in sweaty hands, so if you’re not wearing a good pair of work gloves, these may be hard to hold onto. Summer is rapidly approaching, so that’s definitely a consideration. 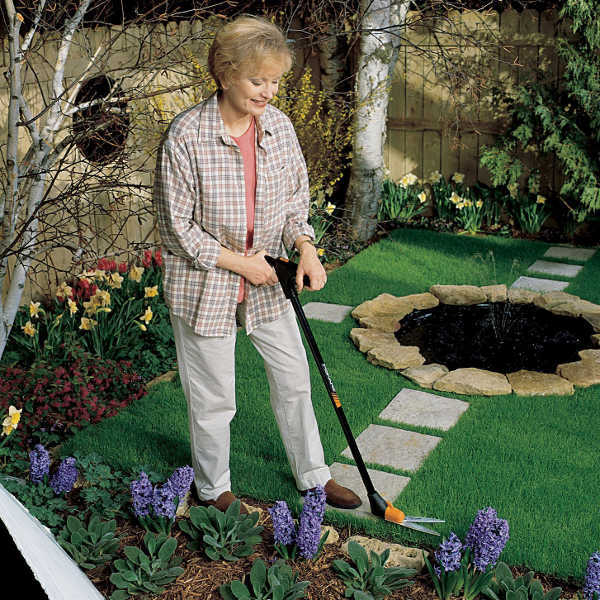 For precise lawn edging, even in inaccessible areas. The Gardena company has been making sturdy tools for years. In this case, these may only be the best grass shears for light work, and I’ll explain why. I really like the wave-blade design, as it makes it much less likely that you’ll jam the blade. The grip is comfortable and easy to use. Unfortunately, the mechanism has one weak pin, and that pin can occasionally fail. If you happen to get a pair where the pin fails, it’s a hassle to get them replaced. Gardena’s customer service department will in fact replace faulty grass shears and get you back cutting. As long as you’ve got a pair that lacks that weak point, you’ll have a tool that will work phenomenally for you for years. One tiny fix to the design and these would be my top pick. Anyone who’s battled with keeping those border areas tidied up knows that having the best grass shears is essential. Hopefully I’ve helped you to find the right ones for your task! What area of your yard is the most obnoxious to keep trimmed to height? 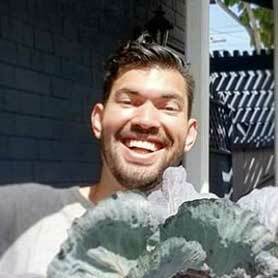 Share your stories of your grass-trimming woes below!